Do you like micro-blogging? To be honest I should say I do not. But I know many people like it. My opinion is if you want try something new or make fun maybe that is a good way, the handy thing is easy and short, you do not need any skill to build a website, you do not need a client to write your blog. You can use your cellphone create an email send it to a micro-blogging site. I think you have some choices to pick one of micro-blogging site, I only introduce one to you here. 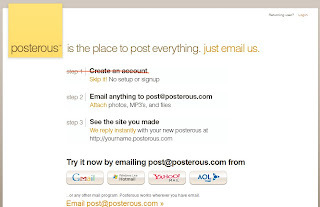 Posterous is a micro-blogging site that lets you use email to create your blog with some media formats, such as MP3, doc, pdf, ppt, and some image formats. It is really simple to do that. You can create your blog as you write an email, you attach your file if you wanted. Subject with your blog title, and send it to post@posterous.com. It will reply your email instantly. You can create a password to keep your new micro-blogging site with yourname.posterous.com. You can see this micro-bloggine site which I made by it.